Go simple or go all out for Diner en Blanc Attire. 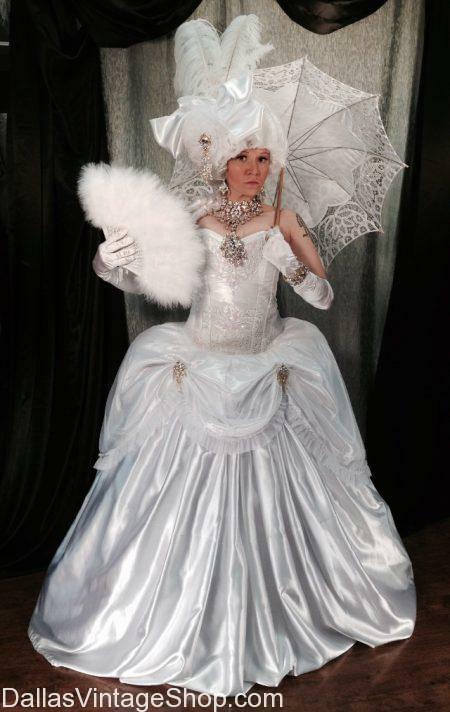 This All White Marie Antoinette Costume is only one of the Extravagant Outfits we can assemble from our ridiculously huge inventory of All White Clothing and extensive collection of accessories in All White. We can do casual, formal, period attire, celebrities, royalty, decades or centuries in All White. Get complete outfits or just the pieces you need. We have the best Diner en Blanc All White Vintage Attire in Dallas. This Gentleman’s 1920’s Outfit is just one of thousands of examples we could easily assemble for you from our unimaginably huge inventory of All White Clothing and Accessories in stock. Any Decade, Any Century, All White Disco, All White Formal Wear, All White Historic Period Clothing and on and on… We have the Best Diner en Blanc Ideas. We are the Diner en Blanc Attire Guide to Period Classics in All White. Who do you want to be…in all white? What is your favorite period attire? Need group themes…in all white? Well you have just found the largest collection of apparel, period attire & costumes…in All White. Get complete outfits or just the pieces you need. Need Diner en Blanc Gentlemen’s Attire. Nobody can beat our selection and creativity when it comes to All White Theme Party Clothing Ideas. From Formal to Pimp Daddy, From Marie Antoinette to Madonna, From Royalty to Hippie, Fantasy to Scifi, Any Decade & Any Century, Any Character & Any Event, we have you covered with the most incredible collection or clothing, costumes & accessories. We definitely have the largest selection of white clothing for men and ladies. You will never, never find a better shop for White Parties & Diner en Blanc events. We have White Fedora Hats, White Shoes, White Vests, White Ties, White Bow White Ties, White Gloves for Men and Women, White Jewelry Pieces, White Boas, White Formal Attire, White Gala Attire, White Period Attire, White Costumes, White Disco Attire, White Baroque Attire, White Tuxedos, White Tail Coats, White Skirts, White Scarves, White Men’s Slacks, White Shorts, White Swag Sticks & Canes, Ladies White Summer Hats, Ladies White Derby Dame Hats, Ladies White Church Lady Hats, Ladies White Whimsy Hats and so, so much more. Diner en Blanc Dress Code is All White Clothing & Accessories with Metallic Jewelry & Rhinestones etc. We have everything you need from head to toe. We can help you get creative with Historical Characters, Celebrities, Decades & other fun or formal All White Outfits. Get the entire ensemble or just the pieces you need. We have so much All White Diner en Blanc Dresses, Gowns, Period Attire, Masquerade Costumes and more. There are even All White Fancy Accessories that would allow you to become any character or dress in All White for any time period, formal or casual, royalty or merchant class or as any movie character, in All White, Your imagination is your only limitation. We have everything you need all in one place, kept in stock all year round. For the most Diner en Blanc: All White Stylish Fashions in DFW you have to come see our huge inventory, in stock. Get complete outfits or just the fabulous pieces you need. The quality, diversity & creativity or our enormous selection will astound you. From Lady GaGa to Cher, from 70s Disco Dude to Mad Hatter, we want to dress you in all white. Your choices are unlimited. Nobody has more Diner en Blanc, All White Clothing for Men than we do. You can dress formal, casual or in period attire because we have such a huge inventory of clothing, accessories & costumes in all white. Get creative or just get by. Get an entire outfit or just the pieces you need. This all white Tubbs 80’s Miami Vice is just one fun idea. What is your idea? You are in Diner en Blanc category.